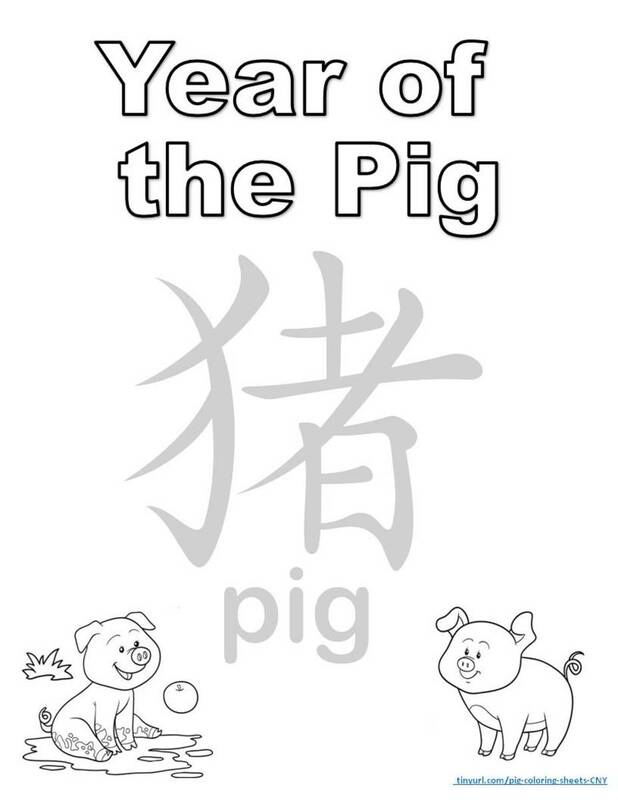 I’ve designed these printable Year of the Pig coloring sheets for young children: preschoolers, kindergartners, and elementary school kids. At the top of this site, you can find coloring sheets with a landscape (sideways) orientation. Then, towards the end of the site, you can find coloring sheets with a portrait orientation (lengthwise). 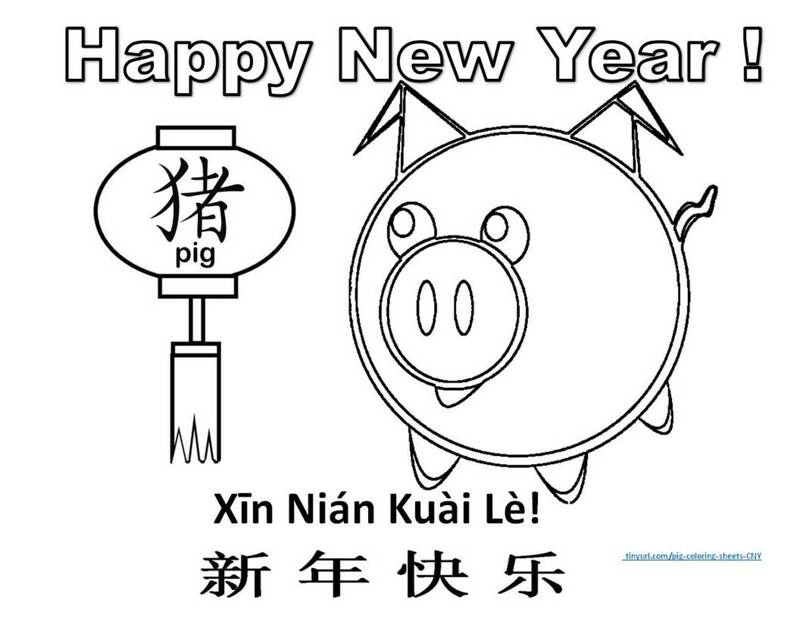 Some of the pigs are my own designs; the other artwork I purchased under license from istock.com. 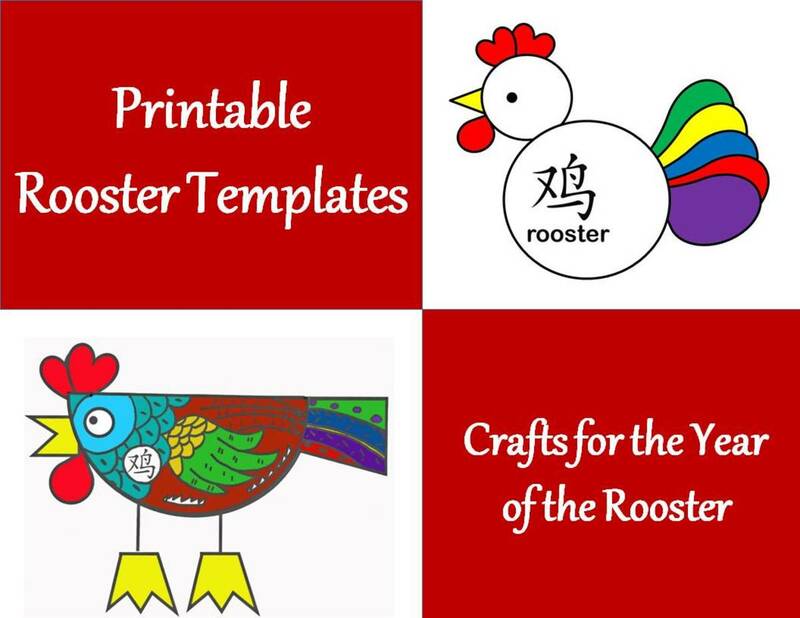 You are allowed to print them for personal, classroom, or library use. No commercial use is allowed. 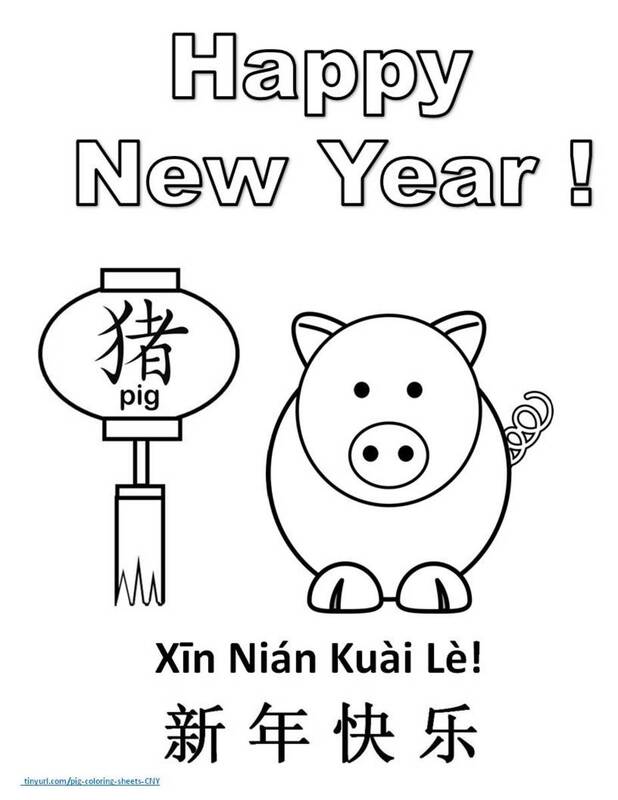 The Chinese character in the lantern is the character for "Pig." 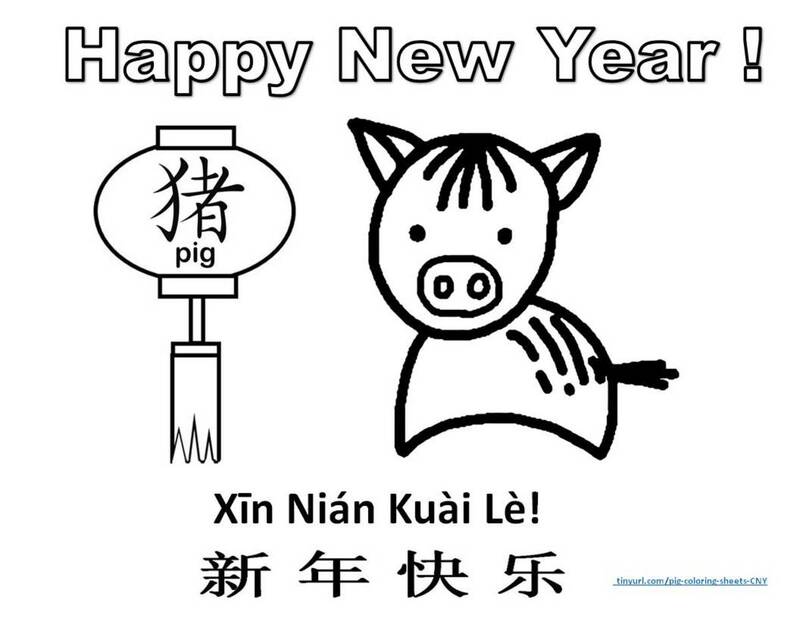 The Chinese phrases say "Happy New Year!" 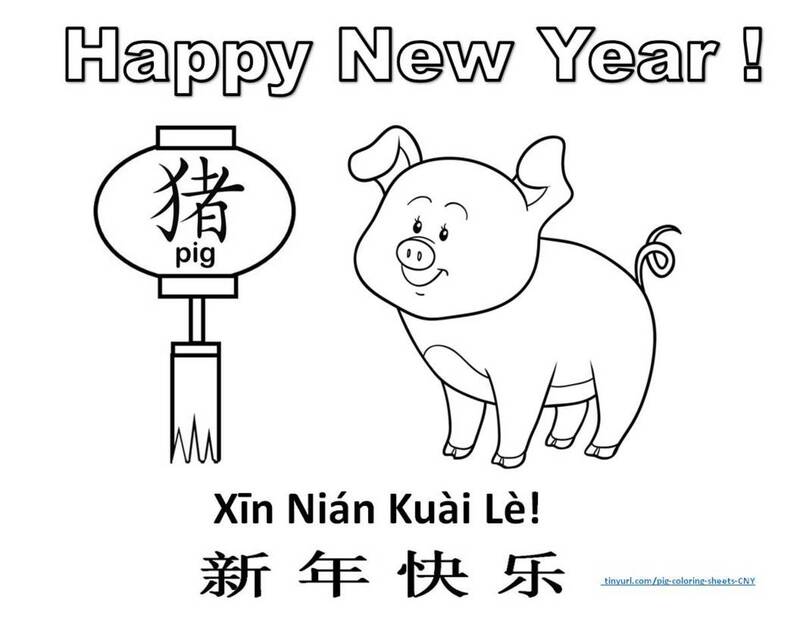 You will see the pinyin—that system which uses our letters to indicate how the words are pronounced—and the same phrase using the Chinese characters. 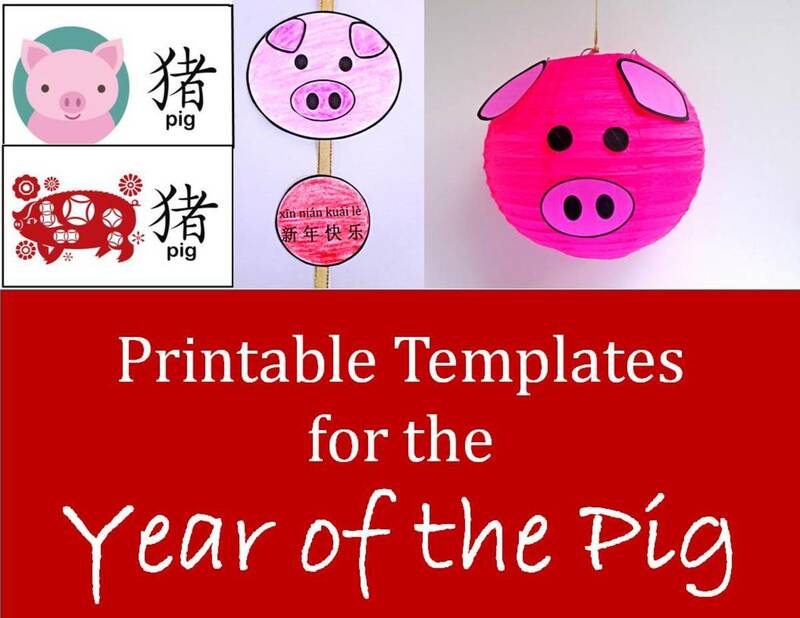 For more craft ideas, see Easy Printable Projects for Year of the Pig. 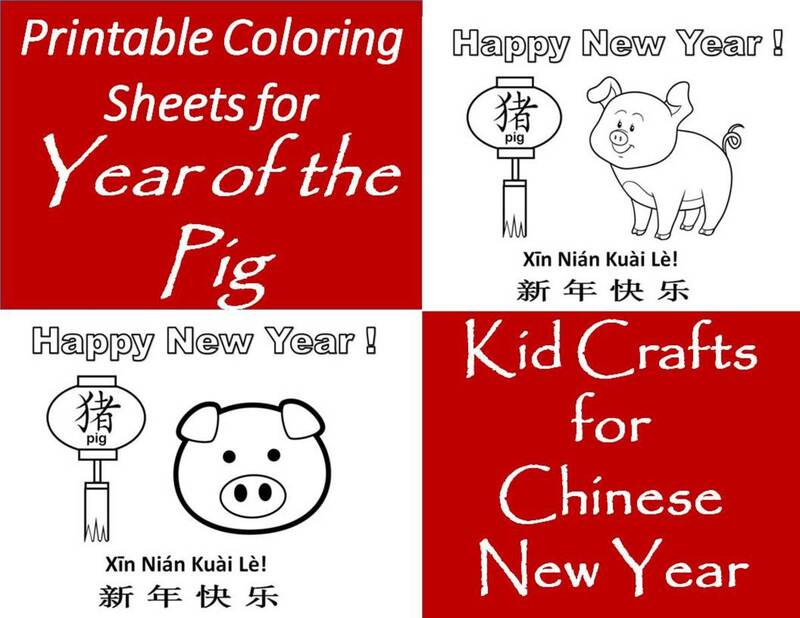 These coloring pages are all sized for 8.5" X 11" paper. At the end of each section, I include a link to a pdf document which includes the templates for all the sheets pictured in that section. The first section has all the documents in landscape orientation, and the second has all those in portrait orientation. 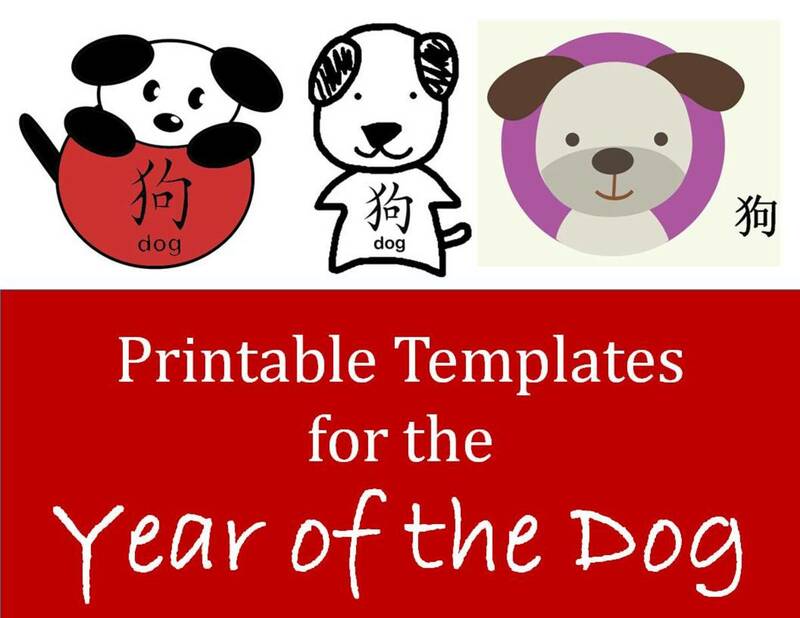 If you just want one page of the templates, set your printer up to do just that one page. If you would like to print some sheets in Spanish, you can find them at the end of each document. The first 10 coloring sheets are in landscape orientation. The link for them is listed at the bottom of this section. If you need portrait orientation coloring pages, you’ll want to scroll down about halfway through the site. 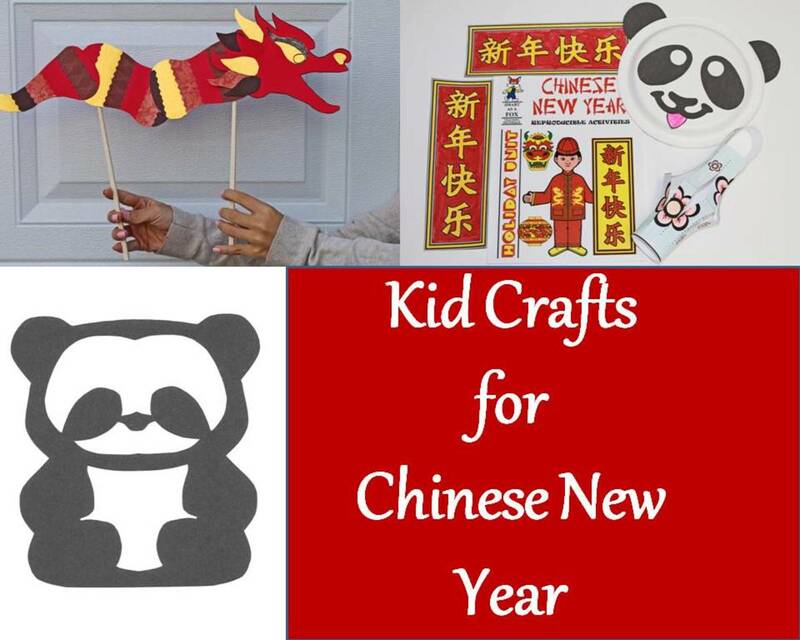 The pattern for this pig is based on the traditional Chinese art of paper cutting. You can click on this link to bring up a document with all the items in landscape orientation. If you want just one of the pages, set your printer to just that one page. The Spanish templates are at the end of the document. 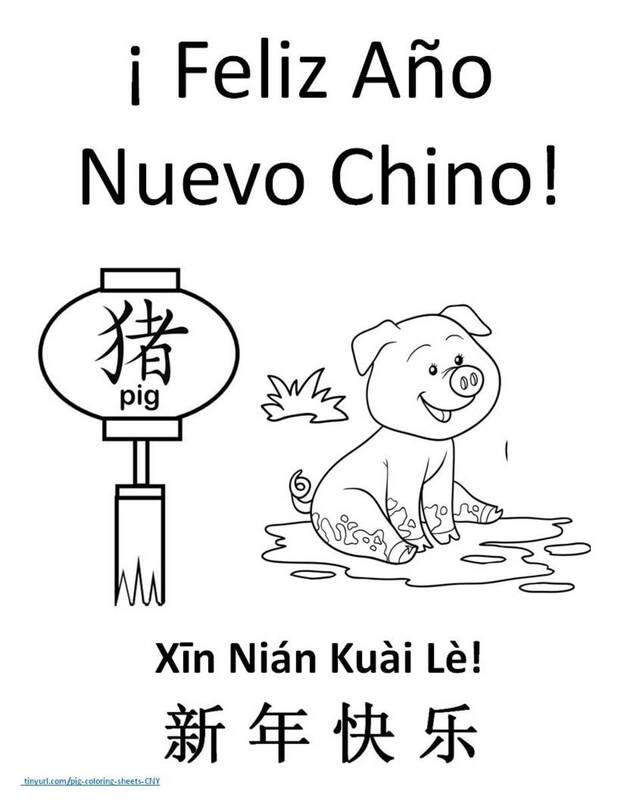 The following sheets allow children to trace the character for "pig" in Chinese. They can use a crayon or pencil to follow the light gray lines of the character. 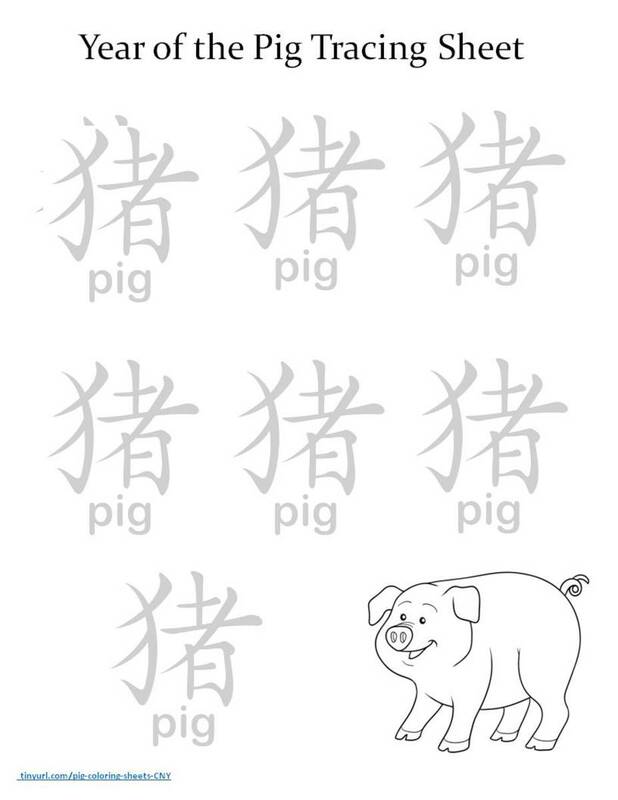 If you would like to see how the character is written, take a look at this Chinese pig character video which shows stroke order and gives the pronunciation. 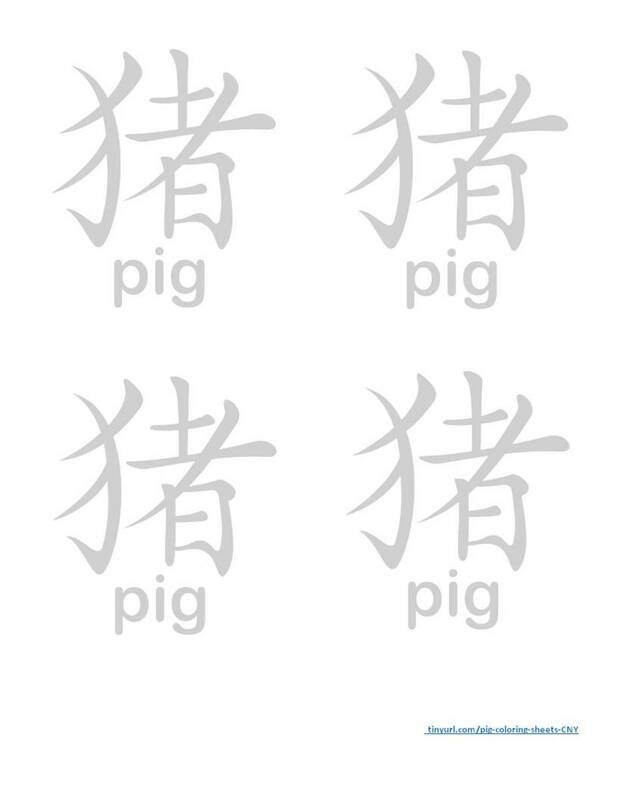 Trace the lines to make the Chinese character for "pig." The following 5 pages are portrait orientation (lengthwise). If you want landscape orientation coloring sheets, go ahead and scroll up on this site. It is probably worth repeating that all of these coloring pages are loaded into this article as photos--as jpegs--and you will need to right click on the photo to copy it. Then, you can paste it into any program you like that will allow you to print it. I like to use Powerpoint, but you can also use a word-processing or publishing program. I make a slide that is 8.5 X 11 inches, then paste the photo I've copied into the slide. You can "grab" the photo by the corner and pull to make the picture larger or smaller. 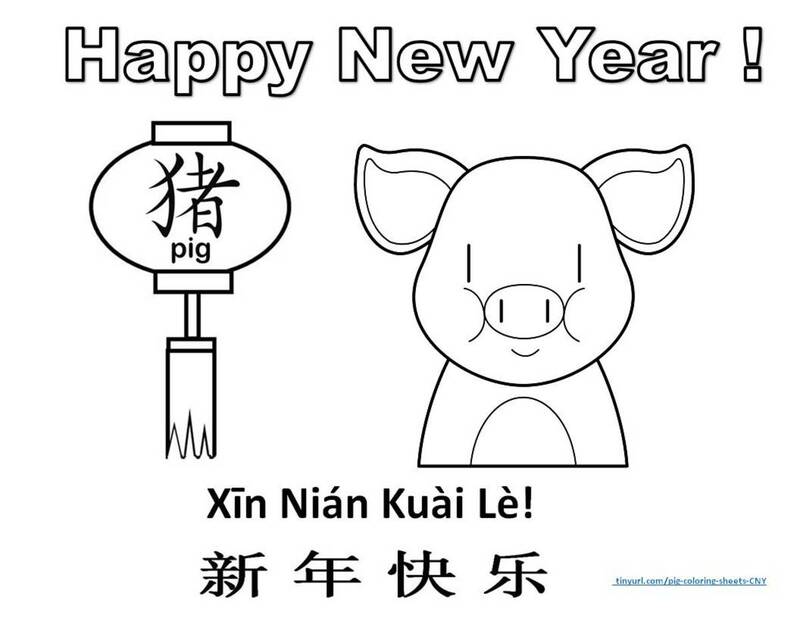 Feel free to copy for home, library, and educational use. Selling these sheets is prohibited. 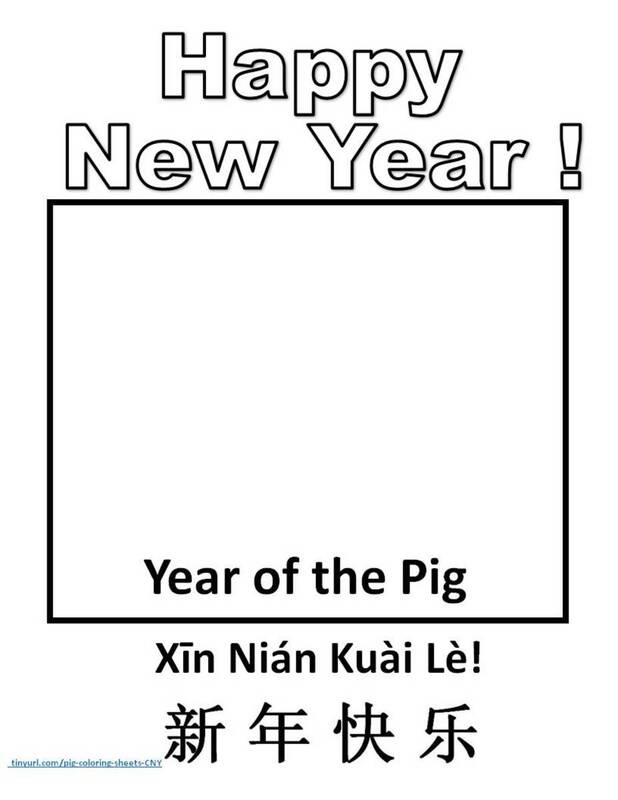 Here is a blank template that allows children to draw their own pig in the center square. 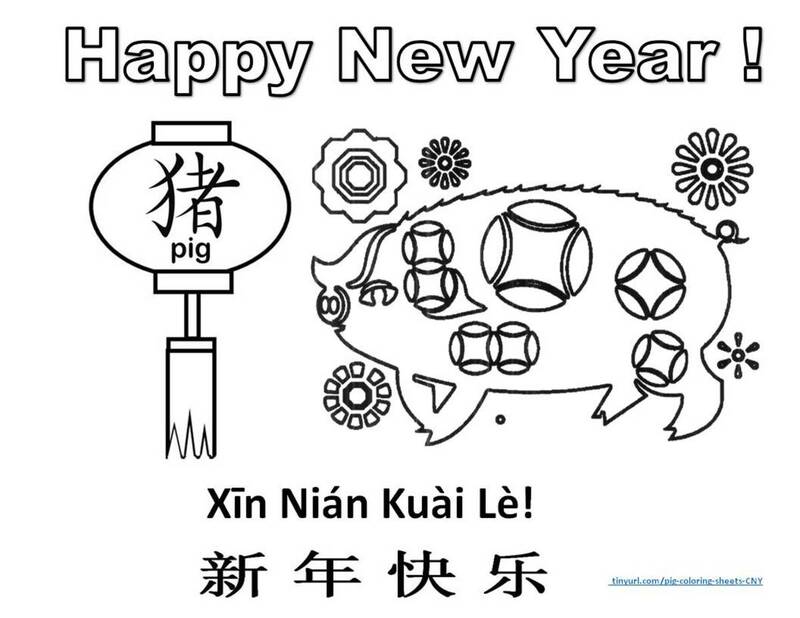 Draw a picture of a pig inside the square. 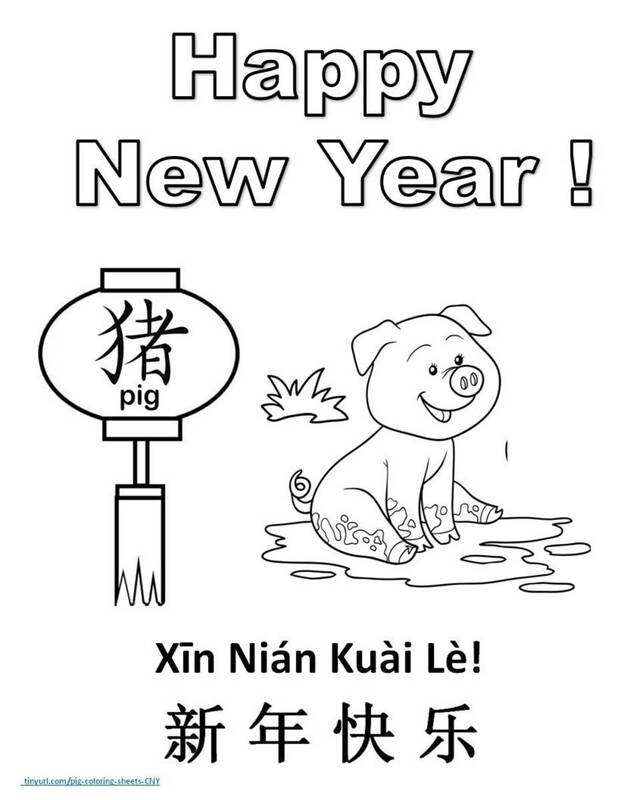 Sample "Draw Your Own Pig"
Here is a sample using the template above. 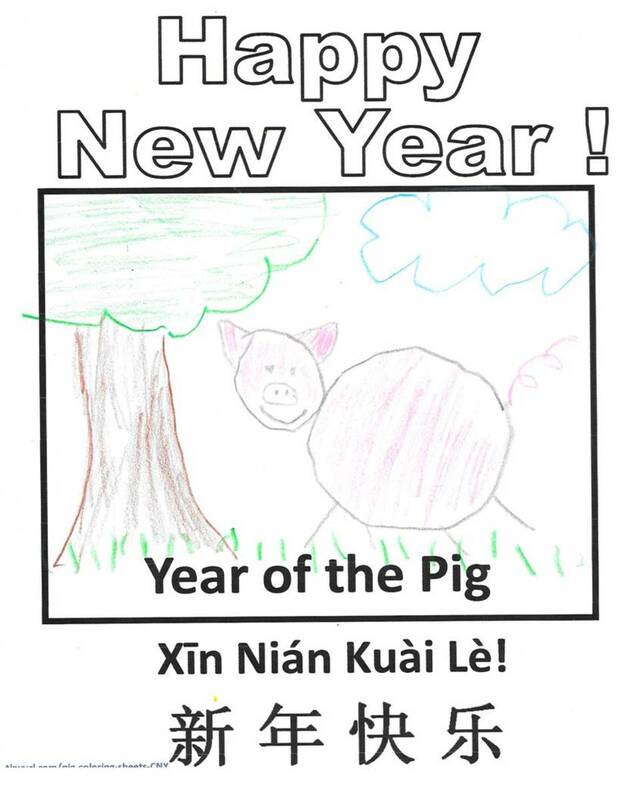 A child has drawn a pig using colored pencils. 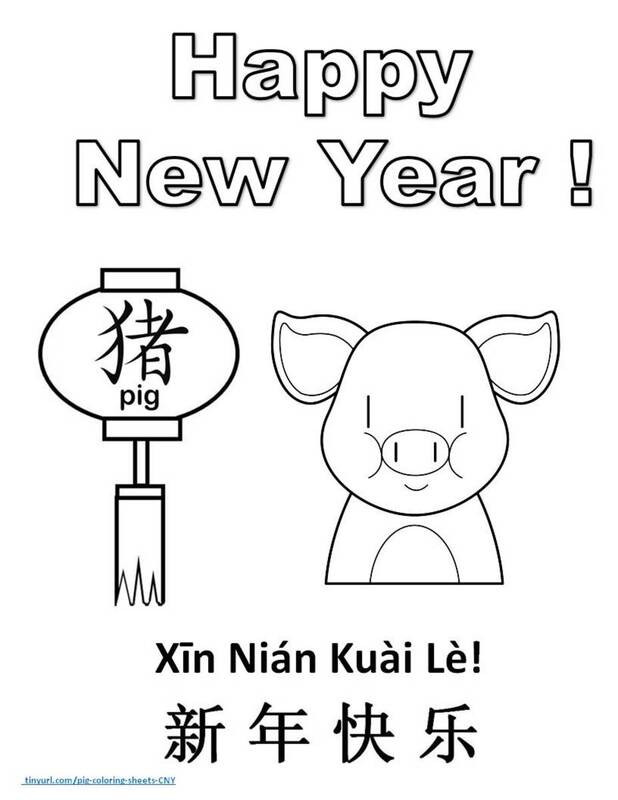 Sample "Cut Out a Picture of a Pig"
Here is another idea you can use with the template above. 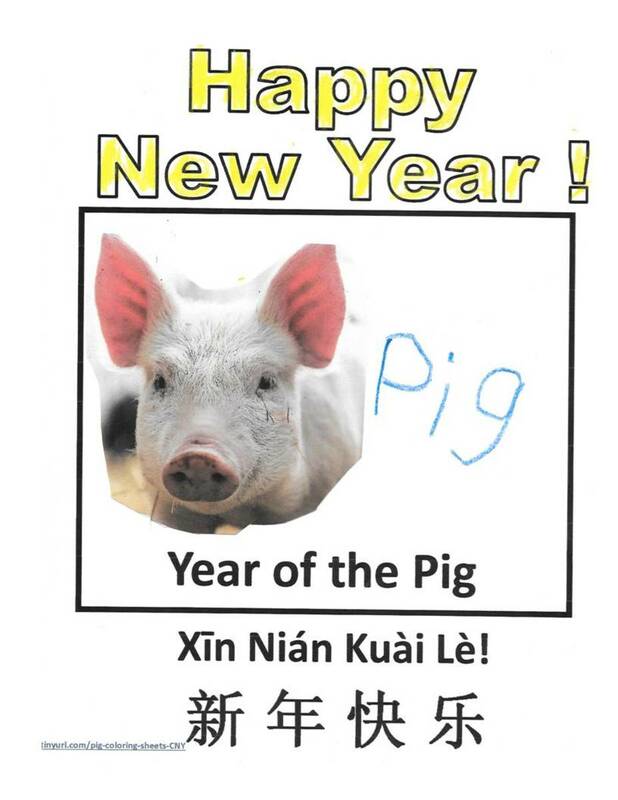 Children cut out a picture of a pig from a magazine (or find one on the internet), then write the word "pig" next to it. Here is the link for the templates for all the coloring sheets that are in portrait orientation. If you need the sheets in Spanish, they are at the end of the document. If you only need one of the sheets, set your printer to just that page. Aquí están algunas páginas para colorear para que usted imprima de forma gratuita. Los enlaces para las hojas están arriba, ya sea bajo orientación vertical u horizontal. 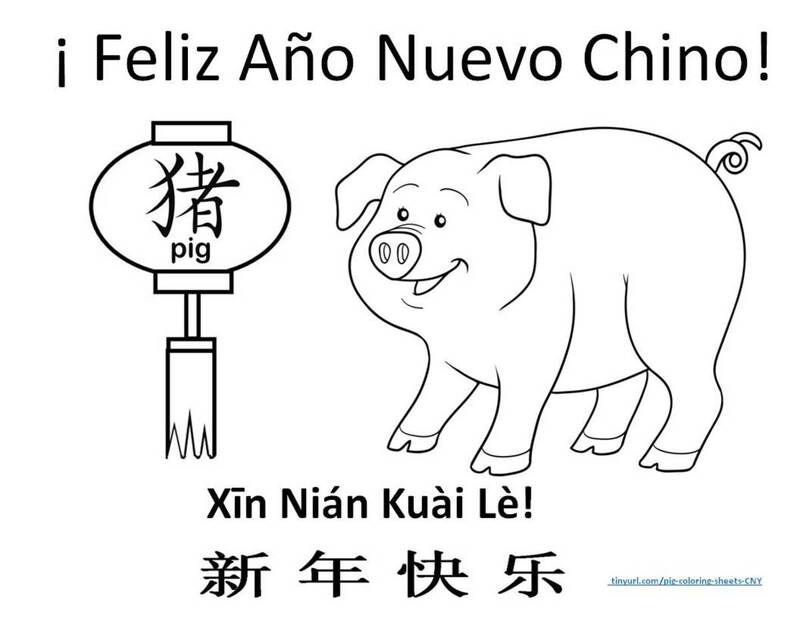 ¡ Espero que les guste usar estas páginas para el año del cerdo! 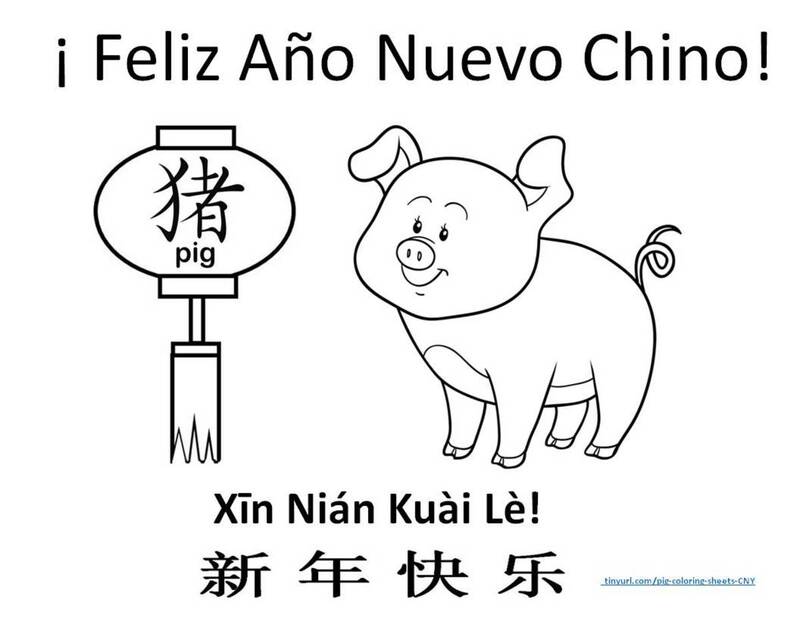 ¡ Feliz Año Nuevo Chino! 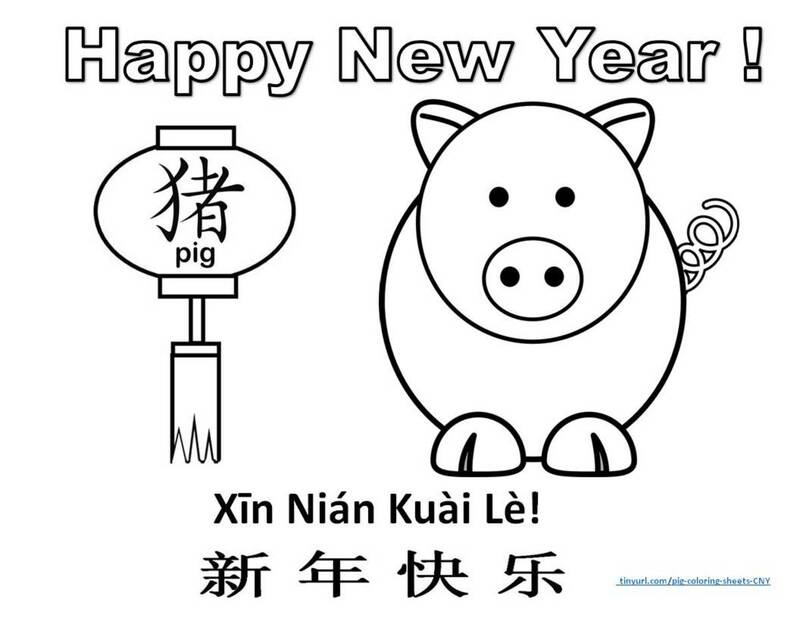 The pig is the 12th animal in the Chinese Zodiac, and the new year (which starts in much of Asia on Tuesday, February 5, 2019) heralds the start of the year named for this considerate and optimistic animal. 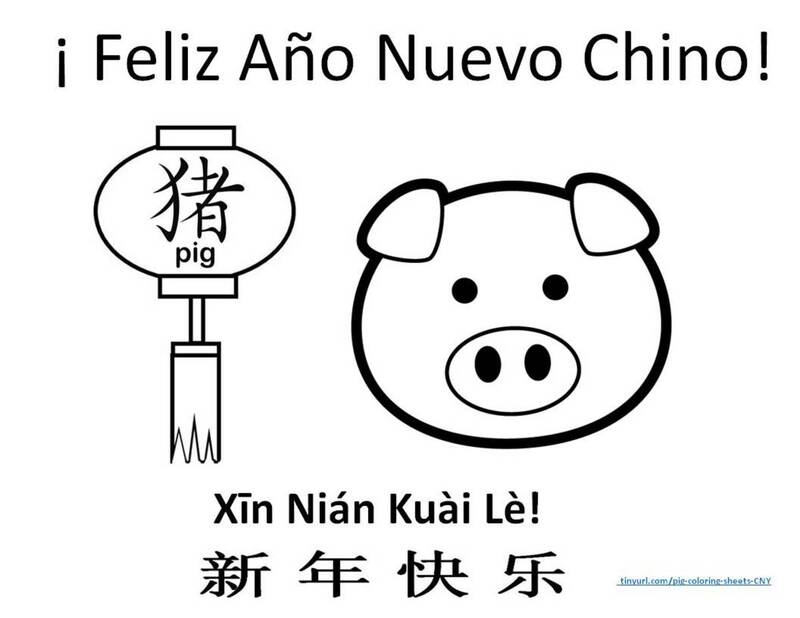 On the plus side, people born in the year of the pig are thought to be generous and forgiving of others’ mistakes. On the minus side, they are thought to be a bit stubborn and emotional. 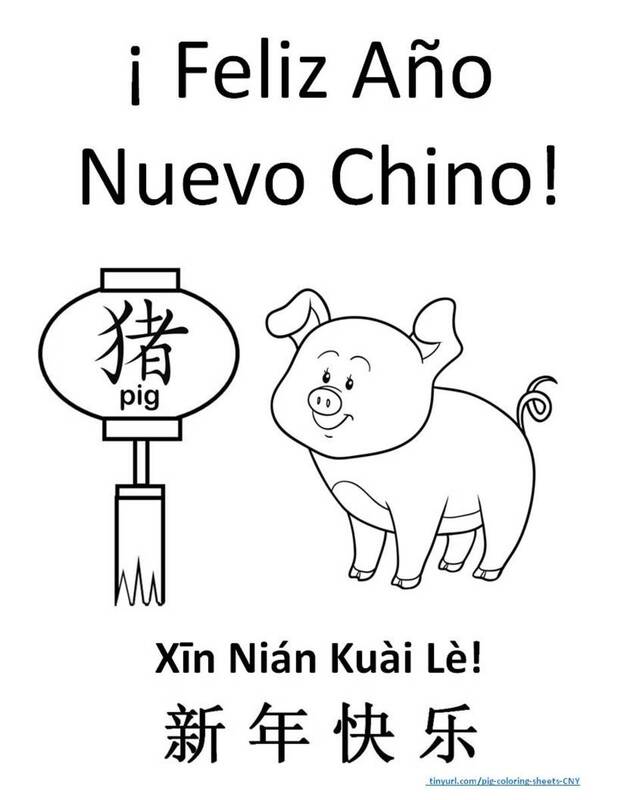 I learned that pigs have a rather central role in the Chinese psyche when I found out that the character for “home” is the character for pig with a roof drawn over it. You hear the phrase “Home is a roof over a pig.” I imagine that in times past when things were hard, you could feel secure if you had enough money to buy and feed a pig and if you could put a roof over yourselves. 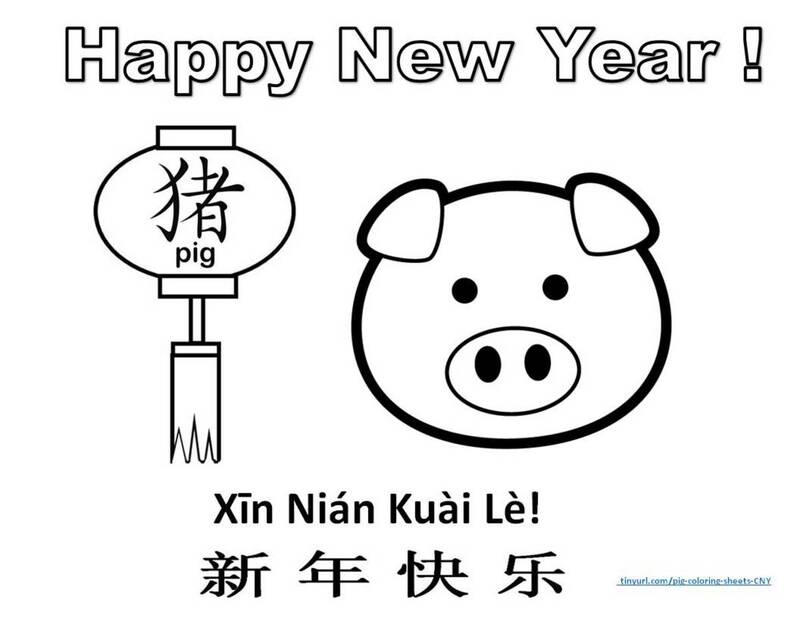 Pigs have been regarded as bringing wealth and do not have any designs on the wealth of others. 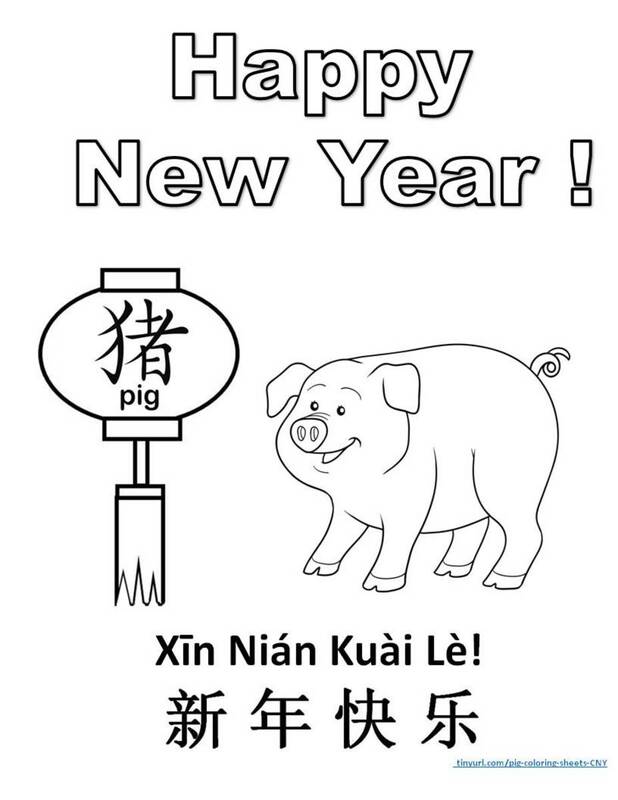 Generally, the years designated as Year of the Pig include 1935, 1947, 1959, 1971, 1983, 1995, 2007, 2019, 2031. 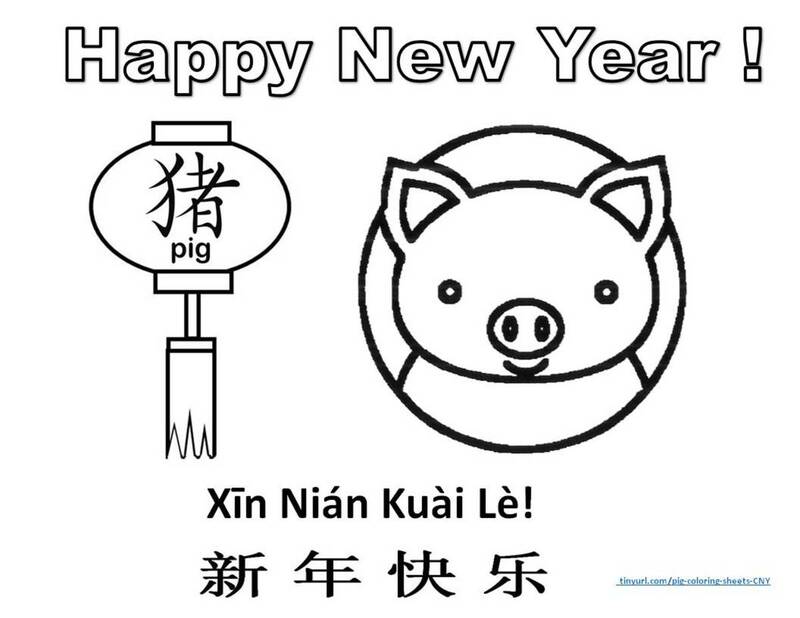 You do have to check, however, when the New Year started in each year, because they don't start on Jan 1. 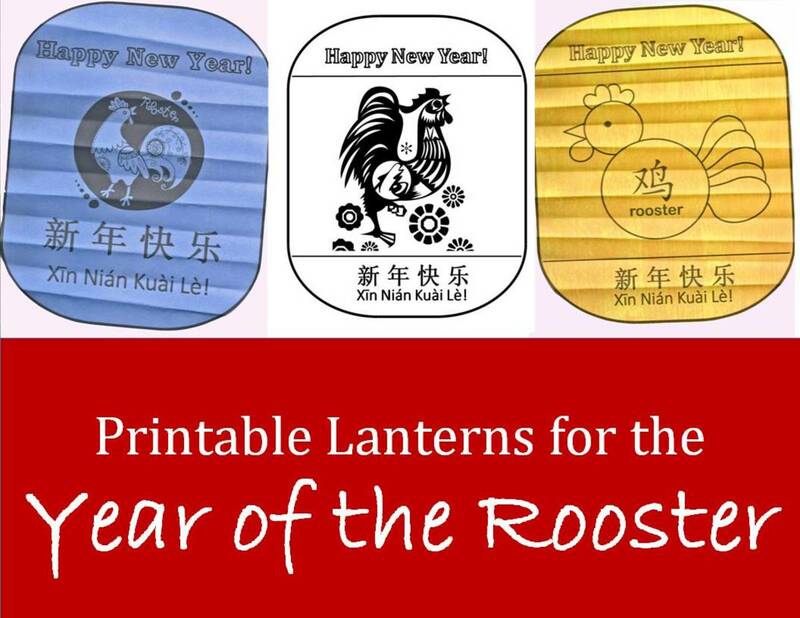 They are calculated according to a lunar calendar, and the date changes each year. 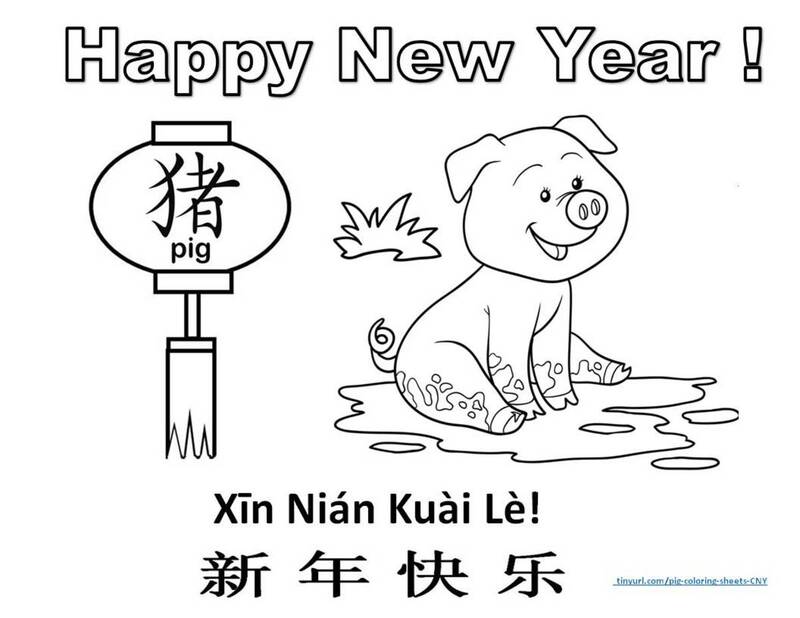 For instance, a baby born in 2019, but before Feb. 5 is still considered as being born in the Year of the Dog. 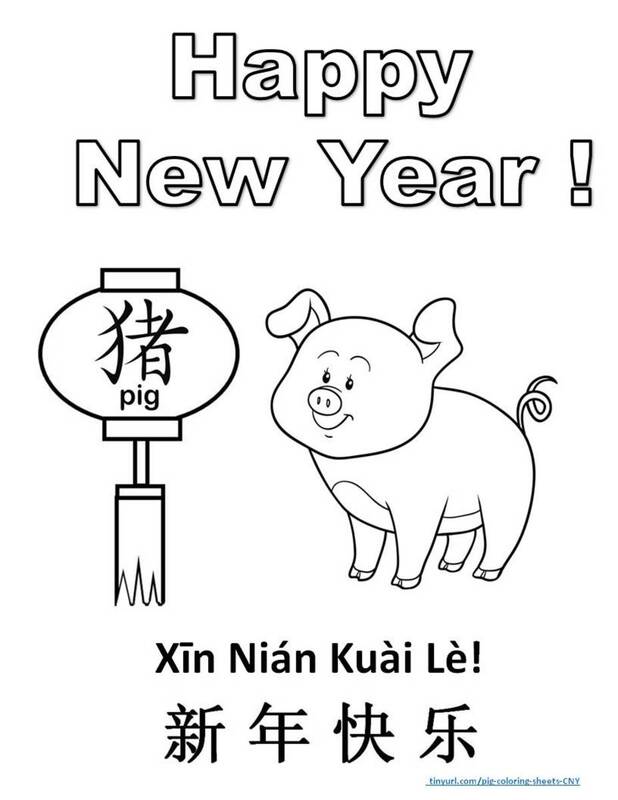 The recommended occupations for pigs are those that serve others: nurse, police officer, priest, professor, politician (they are supposed to serve others anyway) and counselor. 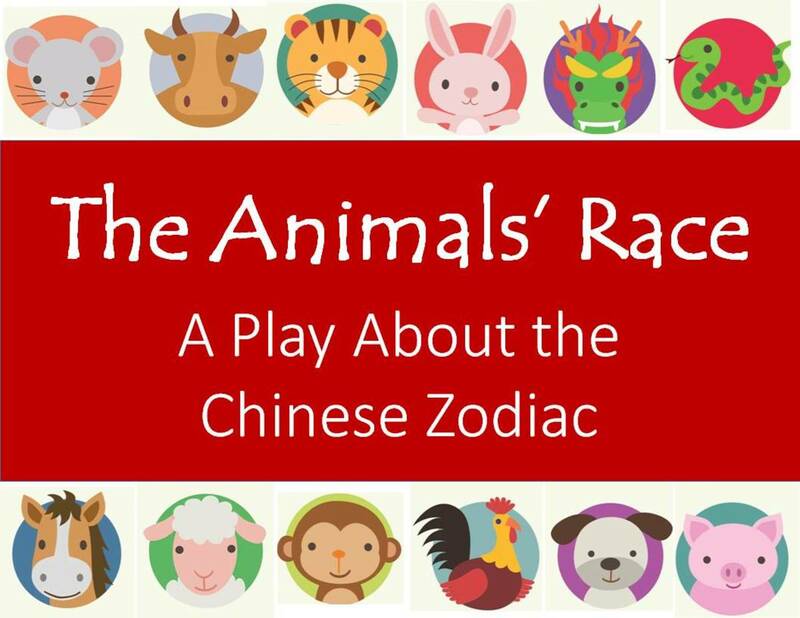 Besides having the animals of the zodiac in a 12-year cycle, the Chinese also have 5 different sets of cycles: wood, fire, earth, gold, and water. 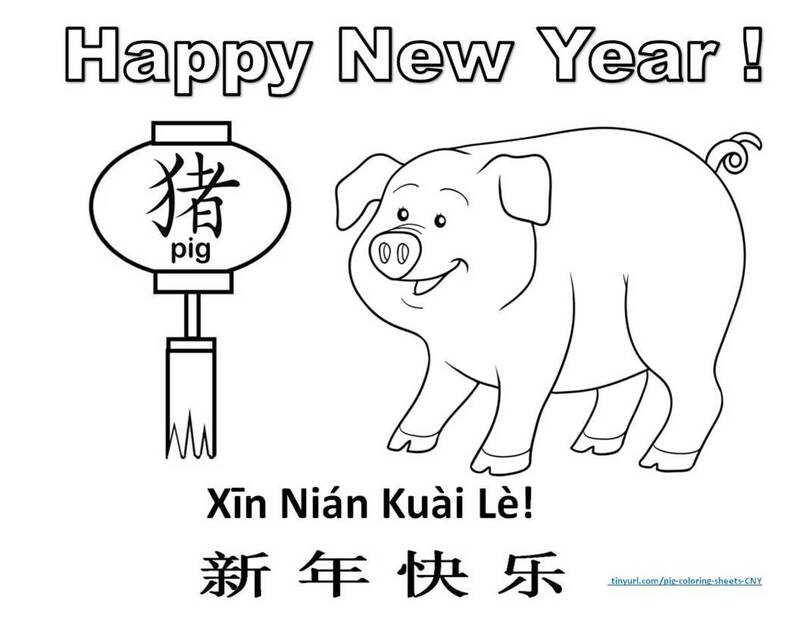 2019 is the year of the Earth Pig, and those pigs are especially god at being social and maintaining interpersonal relations.